Forgive the long string of berry-related posts. This is my 3rd summer blogging and I'm pretty sure I've done the same thing every summer. 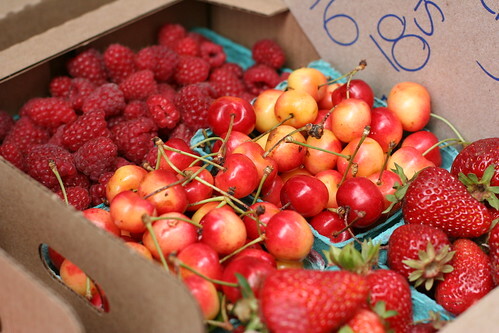 I made my final trip to the Lane County Farmers Market last Saturday. That place has been the highlight of my weekends during the season, and it's one of the things I'll miss the very most about living in Oregon. I wandered around with my camera, some cash, and a starry look in my eyes. And as usual, I was magnetically drawn to the berries. I wound up getting a mixed flat of strawberries, cherries, and raspberries. We're eating most of the fruit on its own (is anything better, really? ), but I had to do some baking with it too. I chose a galette, a rustic fruit tart. Much more my style than pie, to tell you the truth. I eyeballed the amount of fruit, so feel free to play around with proportions, or even different fruits if you'd like. Also, I have a really hard time with the transporting-pie-crust-with-a-rolling-pin thing, so I used an unrimmed baking sheet lined with parchment paper and rolled the crust out directly on the baking sheet. A bit unorthodox, but it worked really well for me. I recommend it if you have a crust relocation phobia too. 1. Preheat oven to 400. Toss berries with sugar (if using) in a mixing bowl and set aside. 2. Put flour and salt in the bowl of a food processor and pulse to combine. Add butter and pulse until the largest butter pieces are the size of peas. Add water, one tablespoon at a time, pulsing to mix. If you don’t have a food processor, put the flour and salt in a large bowl and whisk to combine. Cut the cold butter into small pieces and toss with the flour mixture. With your fingertips, quickly rub the butter into the flour mixture until the mixture resembles very coarse crumbs and there are still some small chunks of butter left. Add water, one tablespoon at a time, mixing and tossing with a wooden spoon. When the mixture just starts to clump together, continue to the next step. 3. Pour the flour/butter mixture onto a floured counter or board and press into disc shape. 4. With a floured rolling pin, roll dough into a large circle, making sure to add a bit of flour on top and underneath the dough occasionally to prevent it from sticking. Roll the dough to about 1/8 inch thick. The circle doesn’t have to be perfect and if the dough starts splitting and tearing, patch it together as best you can. 5. Now gently wrap the dough around the rolling pin and transfer it to the sheet pan. Try to unwrap the dough so that it is somewhat centered on the pan. The pastry circle will overlap the sides of the pan by quite a bit, that’s what you want. Place the fruit in the center, leaving quite a bit of room around the edges. 6. Fold the edges of the pastry over the berries sealing any holes that appear along the edges as you go. You want to seal the holes and cracks so that the juices don’t escape while it’s baking. The pastry shouldn’t cover the berries completely in the center, and should look rustic and irregular. 7. Beat the egg with a splash of water and lightly brush the pastry with it. Sprinkle turbinado sugar (or regular sugar if you don't have turbinado) over the whole thing. Bake for about 35 minutes or until crust is golden brown. Serve warm or at room temperature with vanilla ice cream. Hurrah for summer fruit! We are definitely drawn to the berries at the market and always looking for delicious desserts to use them in...this looks perfect! What a beautiful dessert. I can't wait to try this. Wow! That looks so good. I think I wander around my farmers' market with that same starry look. I have strawberries, blackberries, and cherries in the fridge right now and am thinking about whether I can make something like this with them. Thanks for commenting on my meet the readers post Amy! I can't believe you're moving! I confess you just seem like an Oregon girl to me. Congrats on your *future* baby plans! Hooray! Oh my goodness! This looks absolutely amazing! Now, time for me to use up the rest of the strawberries we have left! yesterday was strawberry danishes made with homemade puff pastry. Today is Strawberry Raspberry Galette! From one berry lover to another -- this looks so delicious! I'm planning to stock my fridge with berries this week, and this recipe may need to make an appearance. 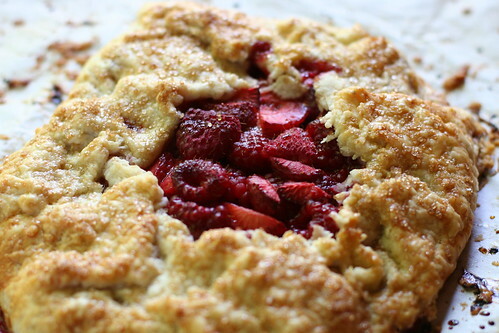 That is what you call Strawberry Raspberry Galette. You will definitely taste the flavor of strawberry because it is whole. You will feel the juiciness of the fruit. Yum. I've been loving the Farmers Market at the Ferry Building in SF. It's the biggest one I have ever seen. You will have to go when you get here. I love raspberry season, I have 5 pounds currently sitting waiting to be something else. Thanks for your recipe to try this weekend.